PG's JESTER - Available for Inspection During the 2017 Palm Beach Boat Show! PG's JESTER is currently located at the Australian Docks in West Palm Beach and can easily be inspected during the 2017 Palm Beach International Boat Show, March 23rd through the 26th! 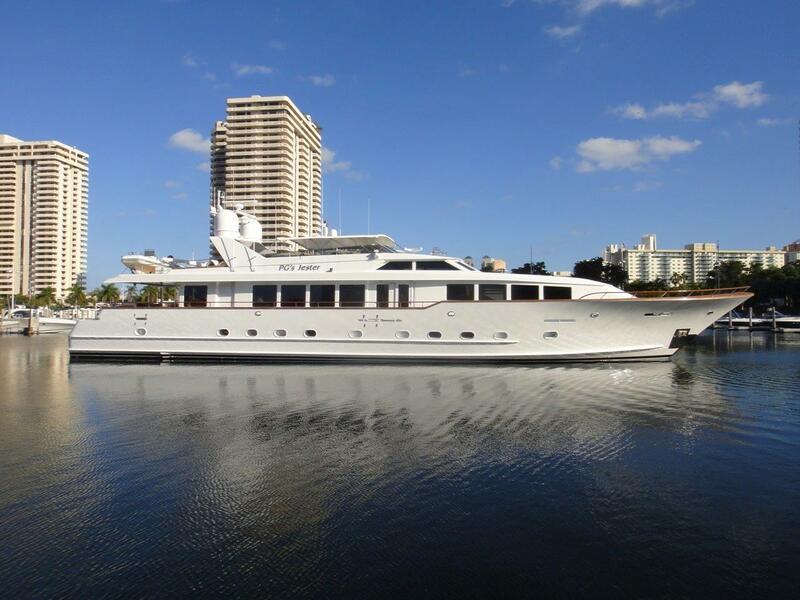 PG’s JESTER, one of the few modern 24′ beam Raised Pilothouse Motoryachts, was built at the peak of Broward Marine’s production. In addition to the obvious extra interior volume provided by the significant increase in beam, she features full walk-around decks, aft engine room, accommodations for eight guests in four staterooms plus crew quarters for five. The main deck is an open arrangement plan with a tremendous feeling of light and space with numerous oversized windows and atrium effect in the salon. This yacht has benefited numerous upgrades over the past years to include complete paint job, 3′ swim platform addition, new custom varnished teak cap rails, teak & holly overhead panels for aft deck, and in 2009, all electronics were updated. In 2010/11, she received a major refit with a complete Matterhorn white Awlgrip paint job, new interior with stained walnut joinery, new carpet, new soft goods throughout, new custom furnishings, new flat screen TV’s and surround sound systems. This custom 118′ x 24′ wide beam Broward features a four stateroom layout plus 4 crew cabins, walk-around decks and has had constant upgrades and improvements throughout the years. She had a 3′ swim platform added, paint job and all navigational and electronics were replaced in 2008/09. PJ’s received another major refit in 2011 to include a complete new paint job, new interior furnishings, carpeting, soft goods, new audio/visual equipment, DDEC engines overhauled, new A/C chillers, new oversized teak caprails, etc. In 2013, her sea chest and windlass was completely rebuilt along with new GE washer & dryers added. PG’s JESTER has been very well maintained and with her constant updates and upgrades in 2016 makes this Broward one of the nicest on the market! Click here for her virtual tour!